Comments by Russian admiral along with the current geopolitical situation could finally prove the catalyst for the construction of Russia’s first floating airfield. 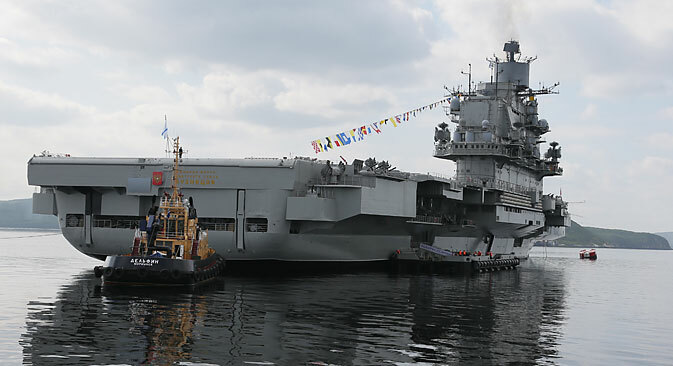 Deputy Commander of the Russian Navy Admiral Igor Kasatonov recently announced that Russia would build its first aircraft carrier – although construction will begin only after 2025. This is not the first time a senior Russian military official has proposed the construction of an aircraft carrier, however, and there is some question about whether this project will actually come to fruition. Historically, the Russian Navy has served as an auxiliary tool for the country’s powerful army. The advent of nuclear submarines in the second half of the 20th century gave the navy a strategic deterrence function, however, which grew over time. In order to protect the areas of deployment of strategic bombers and to be prepared for the possibility of active participation in numerous conflicts in the developing world, the Soviet Union began constructing cruisers that could transport helicopters in the 1960s, followed in the 1970s by cruisers that could carry heavy aircraft. The only ship of this type ever launched was the Admiral Kuznetsov, which under the Soviet system was called a “heavy aircraft-carrying missile cruiser,” or TAVKR, from its Russian acronym. Although the Admiral Kuznetsov was designated an aircraft carrier by the U.S., its mission was different from that of American aircraft carriers. American aircraft carriers are basically a floating base for airplanes and helicopters. The Admiral Kuznetsov, however, also had defensive capabilities. It carried 12 long-range missiles, and the cost of carrying these weapons was space for aircraft along with a lift to move aircraft on and off the deck. The aircraft carrier proposed by Kasatonov will be part of an ongoing modernization of the naval component of Russia’s Strategic Missile Forces. Currently, half a dozen Soviet-built Su-33 planes, which were intended to be based on TAVKR ships, are being retrofitted and orders exist for new MiG-29ks naval fighter aircraft. Plans for fifth-generation carrier-based aircraft are expected in the near future. While the airborne portion of Russia’s naval forces are far into development, their floating airfields are another story. So far, plans for a Russian aircraft carrier have only reached the prototype stage. A model was recently presented at the Krylov State Research Center. This aircraft carrier will be atomic-powered and will carry about 100 planes. It will have a catapult to lift planes on and off the deck along with launch jumps. Even though the state armaments program up to 2020 does not provide for the construction of an aircraft carrier, the industry is preparing for such an order. The current conflict with the West over Ukraine has acted as a catalyst for Russia’s plans to develop heavy warships, including the aircraft carrier. In his statement, Kasatonov noted that Russia would gain experience in constructing and operating of large modern ships while completing the ocean-going destroyer ship “Leader,” which would become the “theoretical basis and the foundation for the construction of an aircraft carrier.” In mid-February, the chief of naval aviation of the Russian Navy, Major General Igor Kozhin said that technically everything is ready and the aircraft carrier may be built in 8-10 years. One open question remains the construction site location for the new aircraft carrier's body, since the Nikolaev shipyard, where the Soviet TAVRK was built, is now in Ukraine. Most experts believe that the construction of a new ship of this class can begin only after the completion the reconstruction of the Sevmash factory, where a long list of orders already exist. Another possible site is the Zaliv factory in the Crimean town of Kerch, which had the largest dock in the Soviet Union. Sergei Aksyonov, the head of the Republic of Crimea, has mentioned the Zaliv factory as a possibility for aircraft carrier construction.